The Jennie King Mellon Library and the Chatham University Archives are celebrating University Day 2012 with a first floor display of photographs and programs from one of our institution’s most elaborate spring festivals, May Day 1920, which also served as the college’s 50th anniversary pageant and a celebration of the end of World War I. 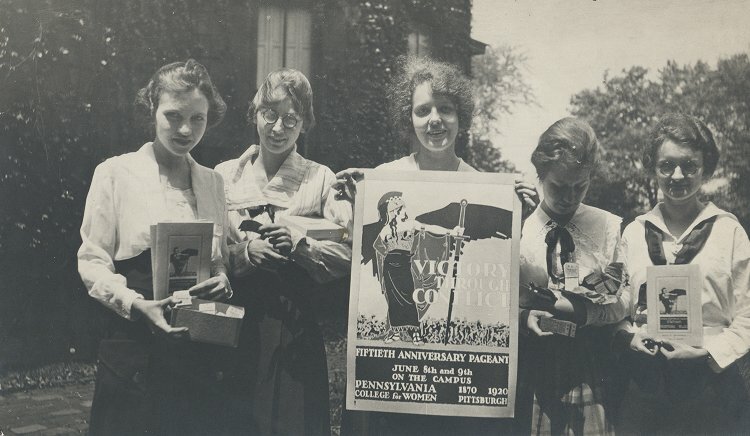 Titled, Victory Through Conflict, the play drew thousands of spectators to the campus over the two day event. Performers included not only faculty and students but also alumnae, local music clubs, children, and live animals. The following is an excerpt of an account of the production published in The Pittsburg Press after the first performance on June 8th. You can view additional images of the pageant and other May Day festivals on our Historic Pittsburgh Image Collection. A pageant of stupendous proportions depicting in three parts, each with a number of episodes, the history of the world to its spiritual significance, from the crossing of the Red Sea by the Israelites, down to the close of the great war, was given by the Pennsylvania College for Women yesterday as the climax of its jubliee celebration. The pageant, given with elaborate detail, and with scenes, songs and speeches of much beauty, closed with Love triumphant, advancing from the lifting clouds of the past, attended by Faith and Hope, and accompanied by Prophecy foretelling the time when liberty shall be proclaimed to the captives, when the waste places shall be rebuilt, and when violence shall no more be heard in the land. The pageant closed with Charles Wesley’s hymn of praise, “Love divine, all loves excelling, joy of heaven to earth come down,” in which the audience of thousands of persons occupying the seats which lined the slopes of the hillside in the natural amphitheater of the college grounds joined.